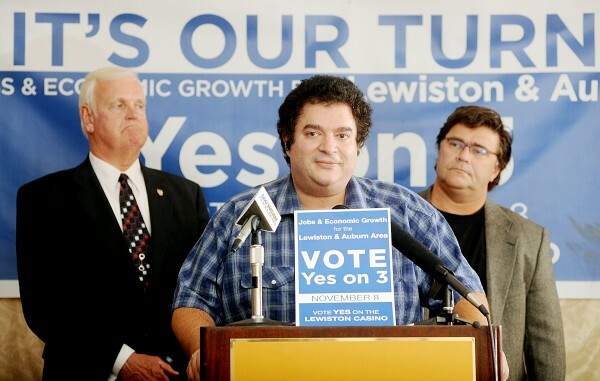 Lewiston Mayor Larry Gilbert, left, Stavros Mendros and Ron Chicoine talk to Question 3 supporters after the Lewiston casino failed at the polls in 2011. AUGUSTA, Maine — Two Lewiston men who were behind an effort to open a casino in Lewiston in 2011 are facing allegations that they hid the source of substantial contributions to the campaign in order to mislead voters. The allegations, made by investigators for the state’s Commission on Governmental Ethics and Election Practices, also say Stavros Mendros and Peter Robinson misled investigators and the media after the vote on the casino regarding the source of the funds. Two political action committees the two men formed to back the casino effort are facing civil penalties of $32,500 for falsely reporting the source of $412,000 in out-of-state campaign contributions. The July 1 memo, obtained by the Sun Journal, and expected to be made public Tuesday along with the investigation’s findings and other documents, states actual contributions, totaling $388,000, came from two Maryland companies and an Oklahoma businessman — all of whom were involved in the casino industry at the time. The memo states that both Mendros, Robinson and other investors in the casino proposal stood to “realize millions of dollars in return for their investments” had voters approved the casino. A referendum question to allow a casino in Lewiston was resoundingly rejected by voters in November 2011. The memo goes on to state it is “implausible to believe the PACs did not know or were confused about the sources of their funding” while charging Mendros and Robinson with specifically misleading news reporters and the commission investigators in the weeks and months following the election. Robinson was the treasurer of the Green Jobs for ME PAC while former Lewiston Police Chief William Welch was the treasurer of the other. Mendros was the PAC chairman for Green Jobs for ME while former Lewiston Mayor Larry Gilbert chaired the other. Gilbert was mayor at the time and is again running for that office, hoping to unseat incumbent Mayor Robert Macdonald. Gilbert said Monday he was on the PAC but did not have any involvement in the finances. He said he didn’t know the PAC was being scrutinized by the state’s ethics watchdog, either. Attempts to reach Welch for comment were unsuccessful Monday. Neither Welch nor Gilbert appear to be the subjects of the commission’s investigation. Mendros said Monday he always believed the donations were coming from the Georgia-based company even though he knew another company, M5, had been formed in Maine and that its principals were negotiating a contract to operate the casino were it approved. One of the primary shareholders of M5, formed as a limited liability corporation in Maine, was also the CEO of GT Source, Dwayne Graham. The investigation also determined that Graham never contributed to the PACs despite statements he made to the Sun Journal that his company was helping to finance the campaign. M5’s principal owners included Scott Nash and Ryan Hill, both Maryland-based businessmen involved in casino gambling and slot machine technology, as well as Chase Burns, an Oklahoma-based businessman with ties to casino gambling, according to the memo. In June Burns was linked to a gambling scandal involving a yacht in Florida that was purchased to “entertain politicians,” according to the Oklahoman newspaper. Burns has denied any wrongdoing in the scandal, which led to the resignation of Florida’s lieutenant governor, Jennifer Carroll, in March. The investigation also discovered that Graham and his company GT Source, despite being a shareholder in M5, never made any monetary contributions to the new LLC. Concerns about PACs’ reporting came to light after Dennis Bailey, with the anti-gambling PAC CasinosNo!, filed a complaint with the commission, just after the election in December 2011. In his complaint, Bailey said it remained unclear, based on the campaign finance reports filed by Green Jobs for ME and the People of Lewiston-Auburn, who was actually bankrolling the effort. Bailey also questioned why the PACs were paying another company, Dome Messaging, based in Arlington, Va., to run the campaign. Based on the campaign finance reports the PACs filed, Dome Messaging was paid $355,000 by M5 to purchase radio and television airtime for advertisements, among other services. The individuals behind Dome Messaging remain unknown. The company’s website lists only an email address and the site is registered anonymously via a Pennsylvania Web-hosting company. “And what is the reason why the Lewiston casino promoters hired a firm that is cloaked in secrecy to run its campaign?” Bailey wrote in his complaint. Mendros said Monday he still would not disclose who was behind Dome Messaging because of a “nondisclosure” agreement he had signed with the company. A letter to the commission from Mendros’ attorney, Mark Walker of Hallowell, states both Mendros and Robinson did not knowingly violate the state’s campaign finance laws and did make every effort to comply with those laws. “The Commission’s lengthy report is long on words, but short on substance that shows any sort of violation of the PAC reporting statutes,” Walker wrote. Jonathan Wayne, the executive director of the Ethics Commission, declined comment Monday on the pending release, noting the documents obtained by the Sun Journal would be posted Tuesday on the Commission’s website — a week in advance of the commission’s next meeting, as is policy. Wayne said it was always the commission’s prerogative to decide whether to go along fully with the staff recommendations for civil penalties or to decide for a lesser or greater amount. Wayne said new information from Mendros and Robinson could also factor into the commission’s deliberations when it meets on Oct. 15. The Sun Journal was paid $5,523.24 for political advertising by the People for Lewiston-Auburn PAC in 2011, state campaign finance records show.